So, I went back to Odaiba a few days ago. When I went the first time to see a replica of the Statue of Liberty, somehow I missed the fact that a giant Gundam robot was just outside the mall entrance, guarding the food court. Needless to say, this is among the coolest things I’ve seen in Tokyo so far. …three of set #3. Which is strange because in Japanese there are counter words, and “three of something” would have been mittsu, which I never said. My guess is that the waiter was accustomed to taking orders from gaijin and ready to assume that when I pointed and said san setto onegai shimasu (“combo number three please”) I meant “three of these please.” Oh well. 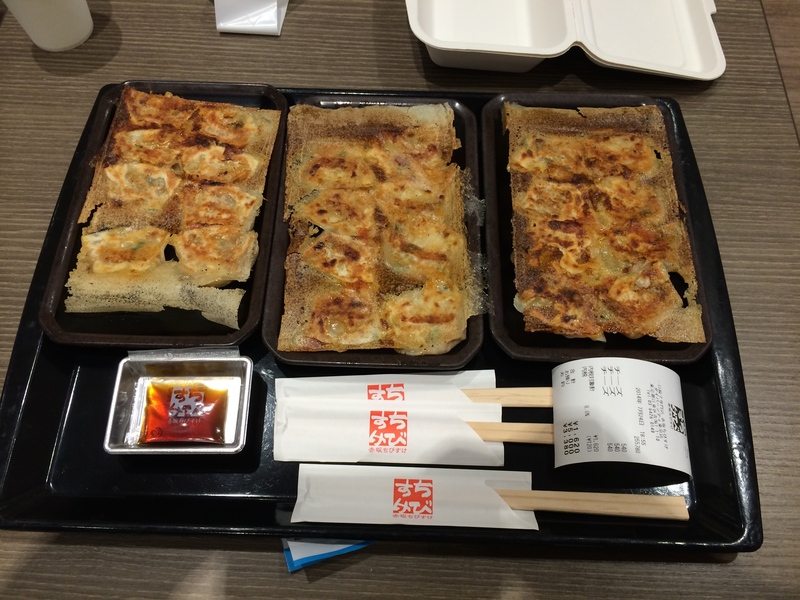 I can think of many worse problems to have than too much gyoza. I ate it all. Next time I’ll try to use my counters properly. Hitotsu setto san onegai shimasu. I didn’t think I had room for desert until I spotted a familiar sign.